Although it's still months away from hitting the book stores, the Miller/Shales bomb-throwing oral history of ESPN, "Those Guys Have All The Fun," is already being peddled on the internet black market. Long time reader first time tipster. 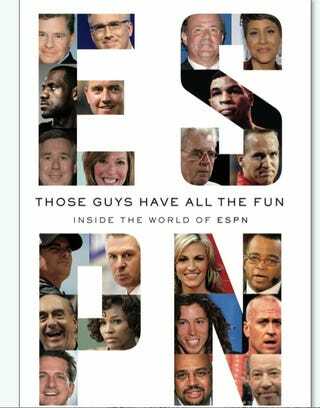 I may, through a friend, be able to get a copy of the ESPN book. I can't really give more details because my friend is worried that more details could lead to her getting fired from her job, but rest assured nothing illegal would be happening (to say nothing of the morality of this situation). IF I could get a copy of the book, would you be willing to buy it? For how much? She's not looking for a ton of money (this isn't exactly the iphone 4, but she wants it to be worth the risk. P.S. obviously this is not my real name. You knew that. My initial bid for the book is $10k, which will be paid out in three easy installments of whatever $10k is divided by three, but only if there's peephole footage of Chris Bermann wearing Crocs, etc. I can't pay anymore than that at this time.